A Twitter user identified simply as Shola (@SheriphSkills) has taken to the social media platform to share a photo of an electricity transformer which was tagged with a "Juju" by residents of an area in Lagos. 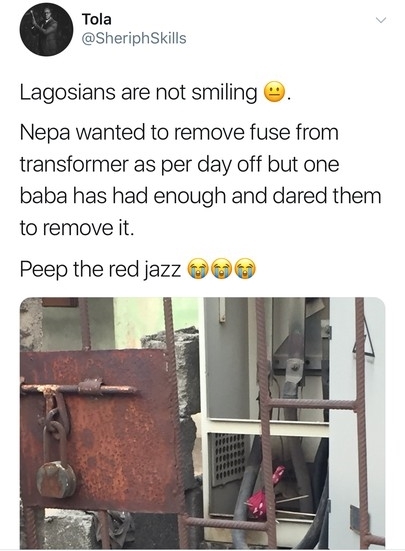 According to the post, some Lagosians who were obviously fed up of how electricity officials disconnect their light, went extreme by tying some fetish items with a red rope to dare them to touch it. Shola posted the photo and wrote: "Lagosians are not smiling. Nepa wanted to remove fuse from transformer as per day off but one baba has had enough and dared them to remove it."